What’s behind a glass of Chianti Classico wine! “Please, for me a glass of Chianti Classico!” Have you ever heard this sentence? This wine is surely one of the best in the world and people use to drink it everywhere. It’s flavors and taste is incredible and you can’t confuse it with other wines. We would like to share with you a beautiful day spent in one of our treasured wineries with our new friends. exploring the region and this charming “cantina” (wine cellar). 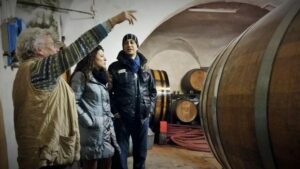 It was a fascinating experience in the world of Chianti Classico wine, learning interesting stories directly from the owners of the winery. What a great day e we had! Feel blessed to promote and support all these amazing producers. They really work with passion and dedication in order to give life to this excellent product. You can recognize a good quality Chianti Classico wine when, during its tasting, you will feel all the passion that each producer put in while making it. To have an educational journey through authentic Tuscan Wines we have set for who is interested the TIPSY TUSCANY experience. 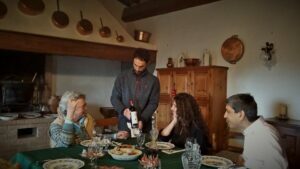 This journey is designed for those who are willing to discover the most famous Tuscan DOCG wines from a different perspective, giving real value to the magic art of making wine. One of the goals of this experience is to demonstrate how perfectly wine can express its territory and cultivators. For more info about TIPSY TUSCANY click here.